You may have never heard of the BBC America sci-fi series Orphan Black. If you haven’t, you’re not alone. Despite multiple critical accolades and enough fanmade Tumblrs to keep anyone occupied for weeks, Orphan Black just seems to be an under-the-radar phenomenon, even though it has recently concluded its second season (ending, might I add, with more questions than answers). Those who love it, though, REALLY love it. The series is centered around Sarah Manning, an on-the-run con artist with lots of eyeliner and enormous Doc Martens. Sarah witnesses the suicide of a young woman who looks exactly like herself, and once she assumes the identity of the woman (because why would you not assume the identity of your suicidal doppelganger?) she discovers that she is one of several clones. The first season of the series is occupied mostly with the introduction and backstory of Sarah’s sister clones, the illness that seems to be infecting them all, and the exploration of why the clones exist at all. The questions that this show asks about so many deep subjects is really quite astounding. There’s the issue of human cloning, the necessity of stem cell research and use, the psychology and biology of individual sexuality. As Sarah meets each clone in turn, she is presented with a very real alternate scenario for her own life. If she’d settled down, would she have been Alison? Alison with a family, a craft room, bangs, and yoga pants? If she’d studied harder, would she have been Cosima? Cosima with dreadlocks and a PhD and a hot doctor girlfriend? What about Beth? Why was she so overcome that her only answer was suicide? As the clones multiply, so do the questions and the urgency of finding answers. And of course, the talent can’t be left unmentioned. Tatiana Maslany portrays ALL the clones (at my last count there were at least 12), and she does so with uncanny believability. It becomes incredibly easy to forget that the women on the screen are only different due to costumes and makeup. 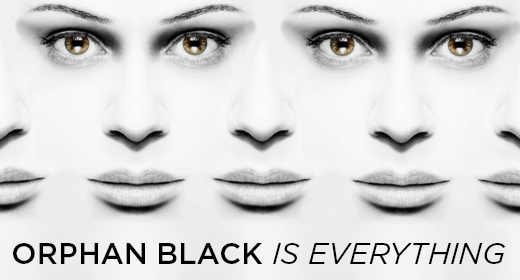 If you do nothing else with your free time when you have it, you should definitely give Orphan Black a try. I guarantee you’ll be at least a little bit intrigued.